When I rebuilt my demo system (some while ago) with PeopleTools 8.52, I noticed a new message generated by ubbgen in PeopleTools 8.52 when the minimum number of recycling servers is set to 1. WARNING: PSAPPSRV, PSSAMSRV, PSQRYSRV, PSQCKSRV, PSPPMSRV and PSANALYTICSRV are configured with Min instance set to 1. To avoid loss of service, configure Min instance to at least 2.
ubbgen is the PeopleSoft utility that merges the template file (psappsrv.ubx) with the configuration file (psappsrv.cfg) file to produce the Tuxedo configuration file (psappsrv.ubb) and the environment file (psappsrv.env). It is invoked by psadmin during Tuxedo domain configuration. The message is produced at this time. Several servers in a PeopleSoft application Server domain recycle after they have handled a number of services. Recycling is a PeopleSoft behaviour and not a Tuxedo behaviour. It is controlled by the Recycle Count parameter in the PeopleSoft configuration file (psappsrv.cfg). This parameter is not referenced in the template file (psappsrv.ubx). ; The default value is zero. 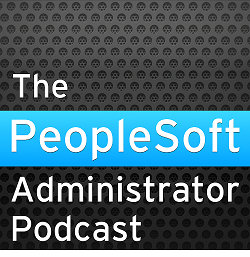 PeopleSoft first started using BEA Tuxedo (as it was then) in PeopleTools 6 to remote call Cobol processes in the Financials product. The Application Server was introduced in PeopleTools 7. PSAPPSRV had recycling from the first release. Legend has it that the engineers at Tuxedo where horrified when they heard that PeopleSoft had introduced recycling to resolve problems created by dynamic memory allocation and deallocation by the Panel Processor (now known as the component Processor). Tuxedo servers are supposed to be robust, long lived and not require to be regularly restarted. Hence the server restart functionality in Tuxedo is only designed to be invoked in the rare occasions when a server process crashes. Server processes are started by the Restart Server (restartsrv), and only one process can be started concurrently. The minimum of 2 applies to the following servers because they can both recycle and be configured to spawn additional instances on demand PSAPPSRV, PSANALYTICSRV, PSSAMSRV, PSQCKSRV, PSQRYSRV, PSPUBHND, PSSUBHND, PSBRKHND. In the delivered configuration file for the developer domain, recycling is disabled for several servers by setting the recycle count to zero. However, the message is produced by ubbgen irrespective of the value of recycle count. The message handler servers can be set to have just a single instance, without producing any warning. They only consume messages from the dispatcher processes so their temporary disappearance will not cause user errors. What Happens When The Only Server Recycles? Tuxedo server processes consume service requests placed on queues. When a server starts up, it advertises its services on the Bulletin Board. Tuxedo processes that submit requests (mostly the JSH processes, but also the message dispatcher processes, the Process Scheduler) look up on the Bulletin Board where a service is advertised and place it on the appropriate queue. When a server process performs an orderly shutdown (as it does during a recycle) it removes the adverts for its services (the command is unadvertise). If a process crashes the Bulletin Board Liaison process (BBL) detects the crash and cleans the Bullentin Board. When all services advertised on a queue have been unadvertised, the queue is also removed from the Bulletin Board. If the process submitting the service request cannot find any server advertising a service it generates an error. 074001.GO-FASTER-6!JSH.3124.5736.-2: JOLT_CAT:1043: "ERROR: tpacall() call failed, tperrno = 6"
This is why the minimum is 2. If you recycled the only server process, it is possible for someone to produce this error (see also Minimum Number of Application Server Processes). Should I set the minimum higher than 2? The number of services handled by different server processes on the same queue is usually uneven because the service is handled by the first free server. Therefore it is rare for the processes will reach the recycle count simultaneously, but it can still happen. Even in a quiet system that doesn't have sufficient activity to justify 3 PSAPPSRVs, I prefer to set the minimum number of servers to at least 3. NB: If the debugger process is enabled then PSADMIN will force the minimum and maximum number of PSAPPSRV processes to at least 2. ubbgen will actually update psappsrv.cfg. Warning:  PSAPPSRV Min Instances too small, setting to 2 for debugger.